There was a big event in Washington DC this week where there was an unveiling of a bust of Vaclav Havel to commemorate 25th anniversary of the Velvet Revolution. 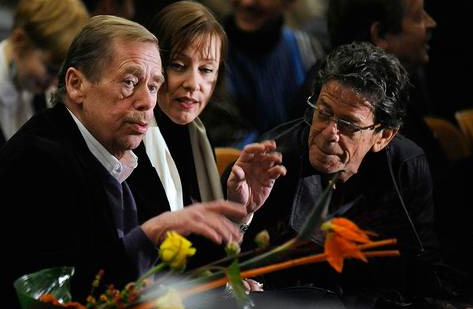 Vaclav Havel was a former president of the Czech Republic and leader of the peaceful Velvet Revolution in 1989 that ended the Soviet-Style Communism in Czechoslovakia. He was also a huge music fan and personal friend of many great artists such as Lou Reed and Suzanne Vega. Suzanne was asked to perform at the ceremony but we had to pass it up as we had a long standing tour date booked in Minneapolis. It was a shame as Suzanne had written a beautiful song inspired by Havel’s vision called Horizon ( A road beyond this one) which would have been perfect for the occasion. Here is a version of the song from when we performed it at the Royal Albert Hall earlier this year as part off the BBC Folk awards. Alison Balsom guested on Trumpet. It seems he was free and came and did almost comical version of “Baby please don’t go”. According to Suzanne, Vaclav had a mischievous side and probably would have loved it ! This entry was posted in News, suzanne vega and tagged Alison Balsom, Billy Gibbons, Gerry Leonard, gerryleonard, http://praguefreedom.org, Prague Freedom Foundation, spookyghost, Suzanne, suzannevega, Tales from the Realm of the Queen of Pentacles, Vaclav Havel, Velvet Revolution, ZZ Top. Bookmark the permalink.